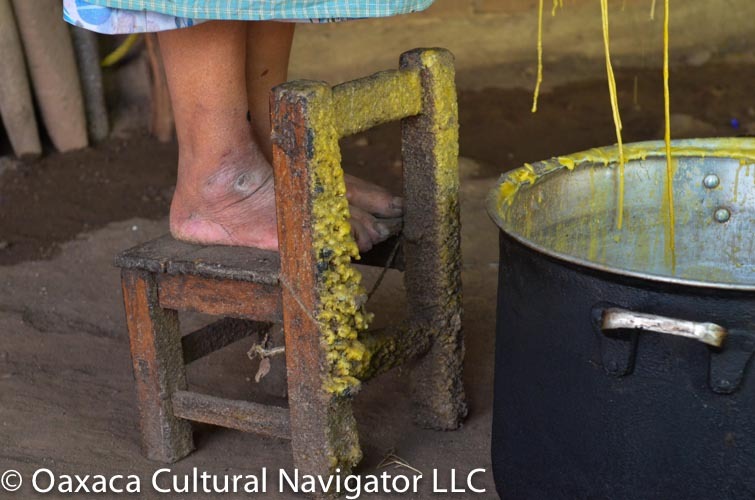 It takes over one hundred passes of hot dripping wax poured over a four or five-foot tall woven cotton wick to create a handmade ceremonial beeswax candle. 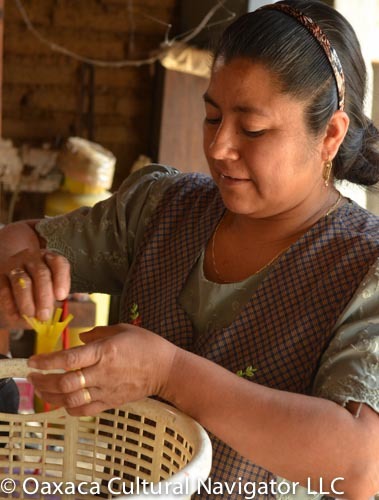 We are in the Teotitlan del Valle home workshop of traditional candlemaker Viviana Hippolito Alavez, who is recognized as one of the Grand Masters of Oaxaca Folk Art. Her work is exemplary. 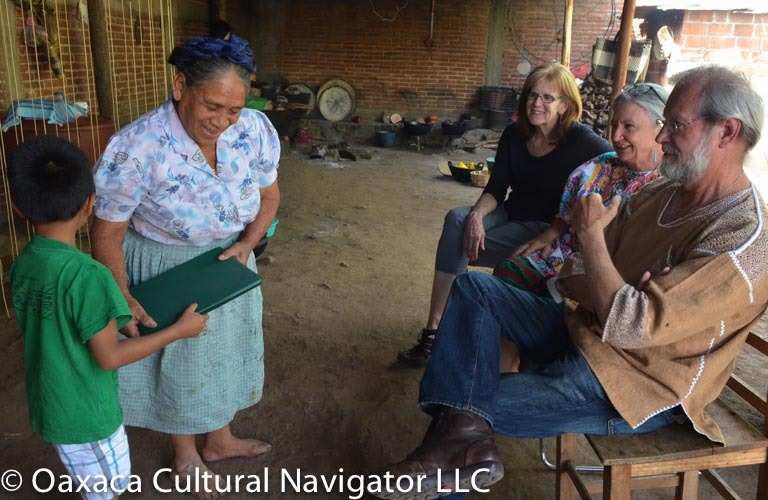 The family lives on an unpaved road off the main street just as you enter the village, about two miles from the Pan American Highway 190. There is a freshly painted, brand new sign at the corner directing visitors to Abasolo #7. It is a humble house, filled with activity and warmth. Viviana greets us with a wide smile and guides us to the covered outdoor space where she works alongside her son and daughters-in-law. They are learning from her, just as she learned from her grandmother. 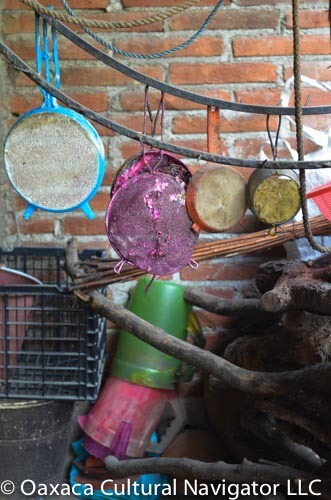 In the corner, a pot of cochineal-dyed wax simmers over a wood fire. It is hazy and aromatic. The wicks are suspended from wheels. Viviana climbs on a small chair that she tells us she has been using for thirty years. It is crusted with wax layers like an archeological discovery. 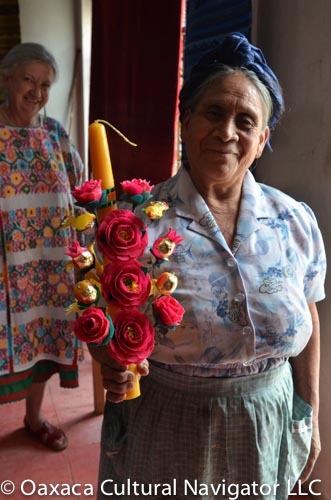 Today, there are only four artisans remaining in Teotitlan who craft these traditional candles that are used every life cycle celebration: baptisms, funerals, engagements (contentamientos), weddings. These are candles used in the church, home altar rooms, and posadas during Christmas, Day of the Dead, and Semana Santa. 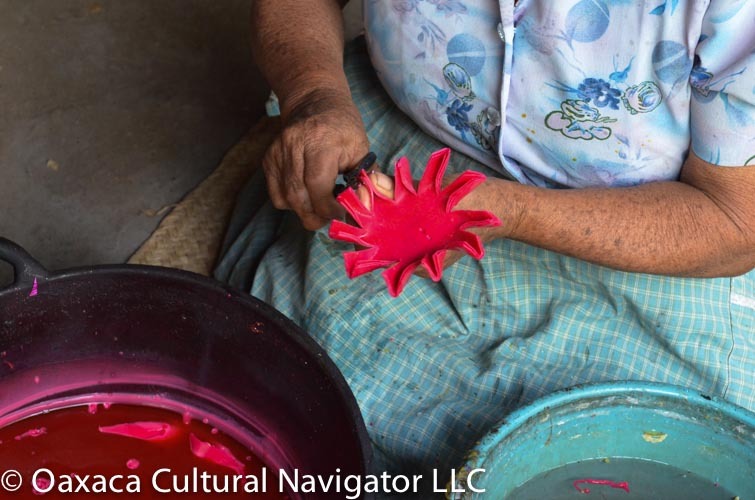 We talk about the abuelas, the traditional grandmothers who keep craft alive. Viviana tells Crespo, you must present your wife with a bouquet of candles when you ask her to marry you. Did you do that? she asks. Crespo’s wife, Ana, stands next to us, smiles and says, no, but he will do that today! 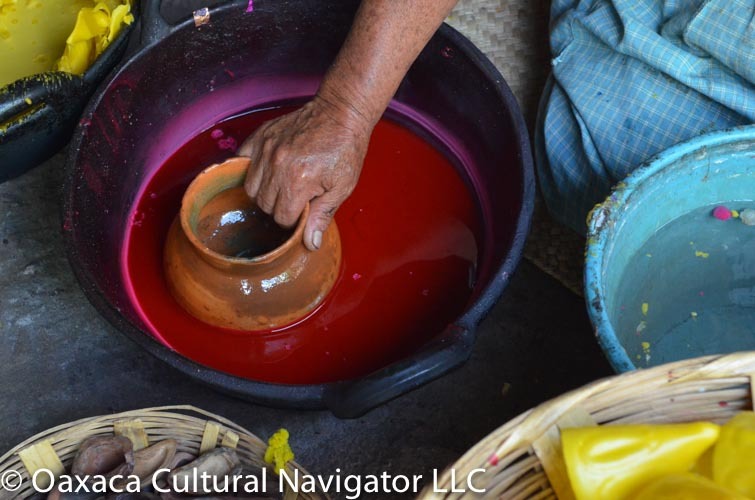 Claudia wonders how long this art form will survive as we watch Viviana first spit on and lick the bottom of the clay bowl before dipping it into the hot wax colored red with cochineal. An enzyme in the saliva must make it easier to remove the wax once it hardens. She then dips it into a bowl of cool water and peels off the circle that will become a flower decoration for an elaborate candle. Will this be the last generation to do this work? Is our visit something that only tourists do, as one village visitor said as she declined to join us? What can we learn here about family, environmental sustainability, and the hard work and time that goes into creating something made by hand? What do we value as a society? 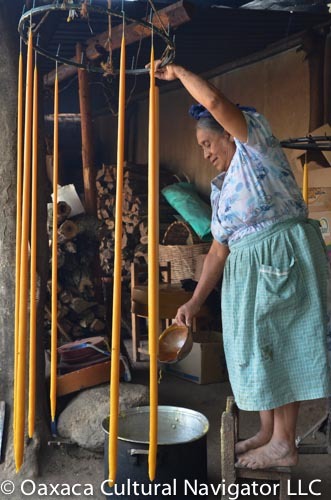 The family uses only natural dyes to color the beeswax and the clay molds made in Aztompa that Viviana inherited from her grandmother. Her son shows us the molds that are intricately carved with figures of hummingbirds, nuts, ducks, and lilies. The type of clay used then is no longer available today. 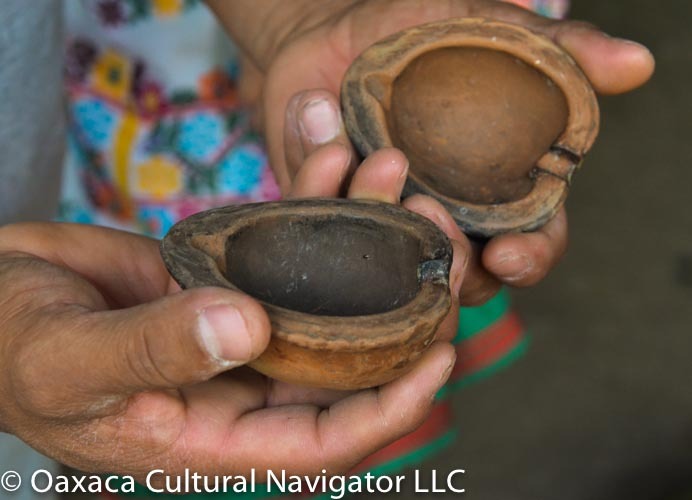 Should it be our responsibility to visit, support, and buy the handcrafts and artwork created here, whatever it is, in order to offer and demonstrate our respect for the traditions that keep a culture vibrant? I believe so. 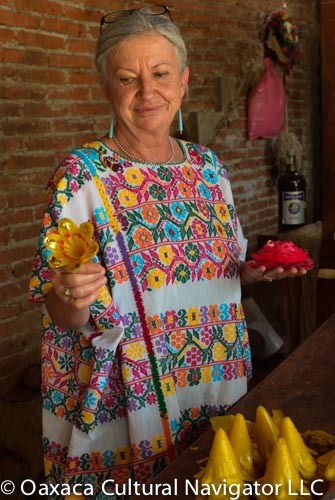 Over the years, I have visited Maestra Viviana many times, never tiring of watching her create, the expression in her face, appreciating the knowledge and rootedness and love she expresses for her traditions. I see the caring and support of her children who help her continue her work. 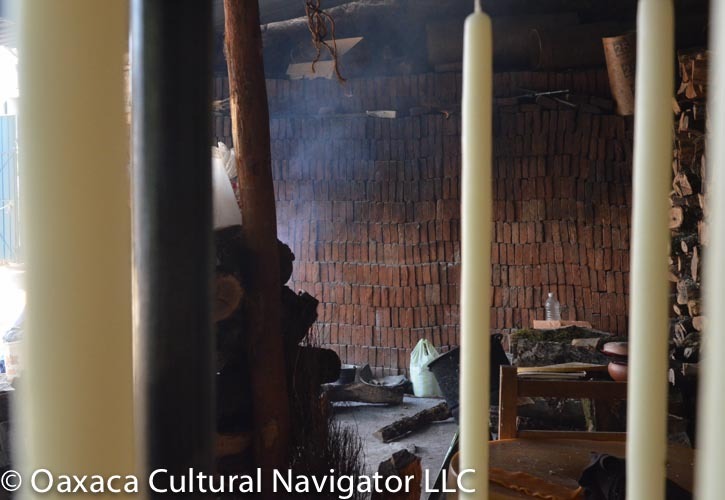 This is a blessing for all of us as she teaches the next generation of candle makers. Best to call in advance to make an appointment for a visit. Impromptu often leads to the disappointment that no one will be home! Although serendipity happens, too! 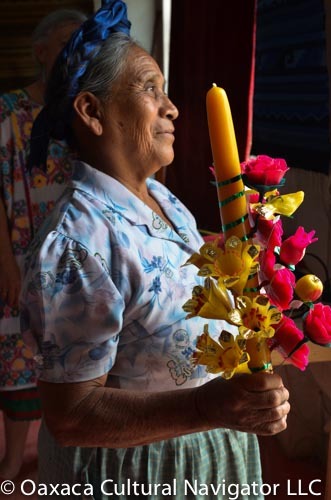 This entry was posted in Cultural Commentary, Oaxaca Mexico art and culture, Teotitlan del Valle and tagged beeswax, candles, folk art, handmade, Mexico, Oaxaca, traditions, Viviana Alavez Hipolito. Bookmark the permalink. 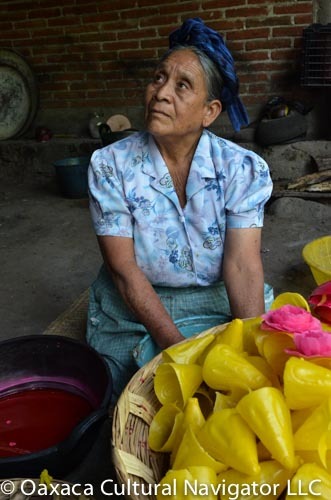 my friend and I are interested in coming to see the candle makers in teotitlan on thursday. we are able to get to the village on our own but wondering if you could schedule a few appointments with us to see the candle workshops. 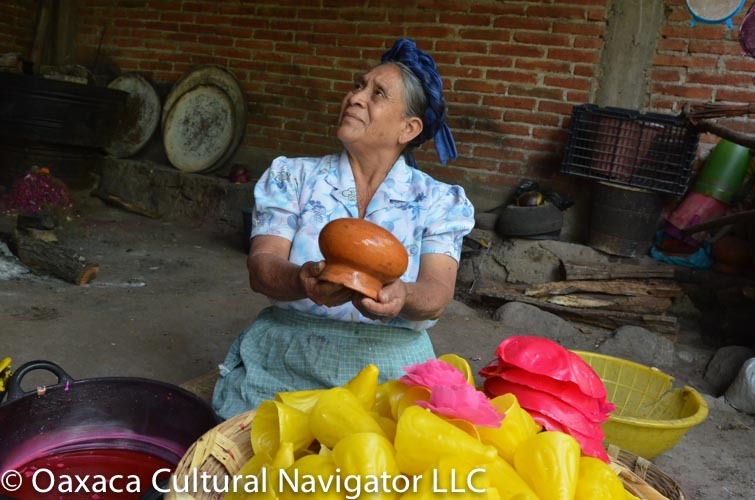 Come to Oaxaca and I’ll take you to artisans with whom you can establish a relationship and purchase. My fee is $200 a day including transportation. Send me an email if interested. Thankyou for capturing that day so well in your words and photos. It was an honor to be watching her work. Later that evening, I sat in the village church listening to a concert. Inside, around the edges of the church were candles like Viviana makes, or perhaps the ones she made. They were decorated with the wax flowers and animals like we saw today. I was grateful I had seen how they were made and how much time goes into them and how they are then displayed in the church. I purchased a rather long plain candle from Viviana and if it makes it home in one piece, I will offer it to our church for our “bringing in the light of Christ” every week.